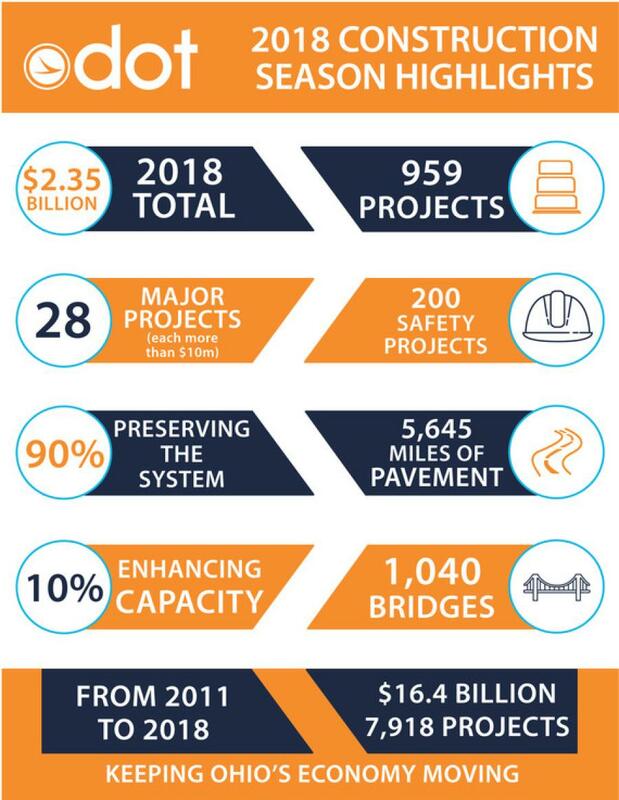 This year, the Ohio Department of Transportation is investing $2.35 billion into nearly 1,000 projects that will preserve existing roads and bridges, enhance capacity and improve safety. ODOT and contractors will repair or replace 5,645 mi. of pavement, enough to pave a four-lane highway from Columbus to Albuquerque, N.M., and perform work on 1,040 bridges. Despite a near-record level of road work, last year saw the second lowest number of work zone crashes in a decade in Ohio. There were 4,891 work zone crashes, resulting in 119 serious injuries and 19 deaths. The vast majority of these crashes were caused by drivers following too close. “We need drivers to pay attention every moment they are behind the wheel, but it's even more vital in work zones. These zones often contain narrow lanes and changing traffic patterns. When driving through work zones, drivers need to leave more room between their vehicle and the vehicle in front of them, slow down, pay attention and avoid all distractions,” Wray said. ODOT crews were struck 152 times last year. Ohio law requires that drivers move over or slow down when they see our crews working along the roadway. Unfortunately, through the years 164 ODOT employees have lost their lives while on the job.